1/2/2009Share this story on Facebook! What is Operation Crossroads Africa? Operation Crossroads Africa is a well-established, cross-cultural exchange program that aims to increase understanding of Africa and its culture. Dr. James H. Robinson, who envisioned a “clear, honest, hard-hitting program” where Western students could work at the grassroots level alongside young Africans, established the program in 1958. The program’s motto is “Make a difference for others, see the difference in yourself." Former President John F. Kennedy referred to the OCA program as “the progenitor of the Peace Corps.” The program has sent over 11,000 young adults to more than 40 African countries, 12 Caribbean countries, and Brazil over the past 50 summers. To become a Crossroader, one must be willing to challenge his or her values and be open to learning and sharing with fellow Crossroaders and the local people in the community. Think You Have What It Takes to Be an Ithaca Crossroader? Scholarships can defray the cost of college, though applying for them is not always an exciting process. 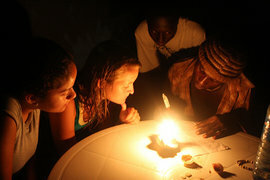 IC offers a truly unique scholarship experience -- a scholarship for an educational experience obtained through service -- in Africa. Students with majors in either the Roy H. Park School of Communications or the Department of Politics are eligible to apply for the Reginald “Reggie” Simmons Memorial Award, which covers the cost of participation in the eight-week Operation Crossroads Africa (OCA) summer volunteer program for two students each year. Reggie Simmons ’75 was a renowned scholar of political science and African affairs. He devoted his career to improving the lives of African citizens. When Simmons passed away in 2003, at the age of 50, his former classmate and the current CEO of Disney, Bob Iger ’73, established the award in his honor. The Reggie Simmons award is an opportunity that has truly changed the life of its inaugural recipients. When Michelle Diemer ’08 received the award in summer 2007, she had no idea how ensconced in West Africa she would eventually become. Michelle volunteered in Jambanjelly, working to build a library for the villagers there. Upon her return to Ithaca College she developed the Books for Gambia campaign, in an attempt to raise the money needed to furnish the library with 25,000 books. Michelle returned to West Africa following graduation, after being rejected from some of the jobs she applied for in the states. “Each time I received the notorious two-lined letter stating that the position I'd applied for had been filled, I would be somewhat relieved because I knew my heart was leading me back to service work in Gambia,” she says. Michelle took a job teaching English near Jambanjelly, making roughly $150 a month. After some time, she relocated to Gambia to become a senior manager at a technologies company. Fuse’s own Jeff Goodwin ’10 was a 2008 recipient of the award. Jeff worked in Jambanjelly alongside local volunteers to finish the construction of the library Michelle had started. Due to supply schedules in Africa, the books from IC’s successful Books for Gambia campaign began to arrive just as Jeff was leaving. Jeff has remained in contact with the villagers who bike to a nearby city and use internet cafes to e-mail Jeff about the project and hear about his life back home in Ithaca. Jeff stayed in a family compound, which was about the size of an average front yard here in the states. On average, 40 people live on one family compound in two different houses. Their house was divided into an open dormitory room for girls, another for boys, and a small living area with a separate bathroom and no running water.